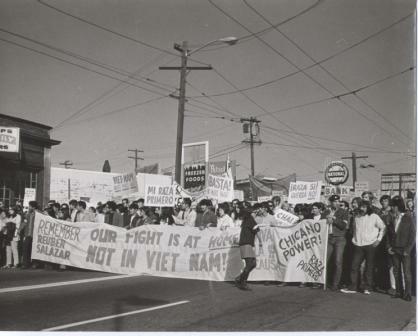 The Seattle Civil Rights and Labor History Project is being taught in many classrooms at all levels from middle schools to the University of Washington. We have a great set of resources for educators, including short films, powerpoint slide shows, primary source document sets, maps, photo collections, oral history selections. We also have a growing collection of ready-to-use lesson plans that offer exciting in-class and out of class assignments. Looking for lessons that fulfill particular GLEs? Click our GLE guide. Teaching about a particular decade or issue? Our content guide lists primary sources, secondary source reports, oral histories, and other materials by decade and subject. When it opened in 1942, Yesler Terrace was the first integrated public housing project in the nation. Here children of defense workers open the new playground. Photo: Museum of History and Industry. What works best? 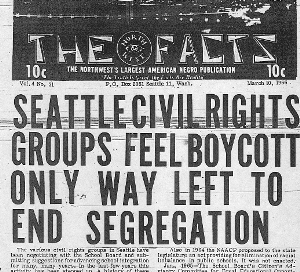 If you have used some part of the Seattle Civil Rights and Labor History Project in your classroom, please let us know. We appreciate advice from teachers. Contact Teresa Frizell, Teacher Outreach Coordinator, frizellt@gmail.com. 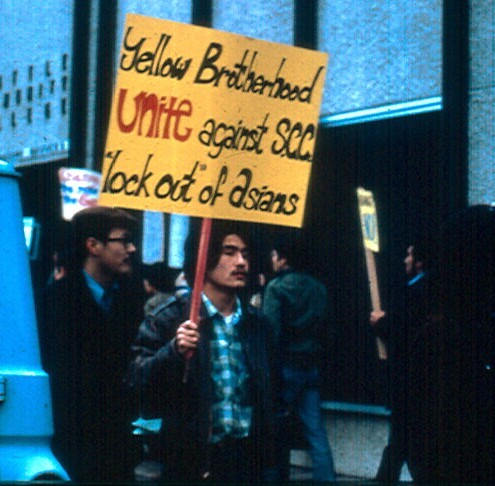 This lesson will familiarize students with the concept of protest by breaking it down into parts, identifying those parts, and then analyzing a variety of types of protests by racial groups in Seattle and Washington State during the mid-twentieth century. They will work in groups and individually in order to distinguish between examples and non-examples of protest, while familiarizing themselves with such language as “protest,” “estrangement,” “alienation,” “status quo,” and “tradition.” Created by Stacey Joyce, M.Ed. 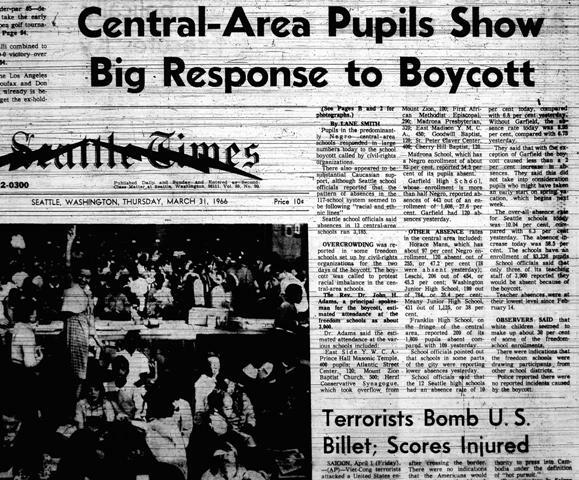 Students will synthesize their prior knowledge of southern-based Civil Rights movement with new knowledge about Seattle’s own struggle through their response to the Document Based Question: “Compare and/or contrast school segregation in the southern United States with school segregation in Seattle.” Created by Teresa Frizell. This lesson is designed to develop a deeper understanding of what it means to be a part of the documentation and creation of history. 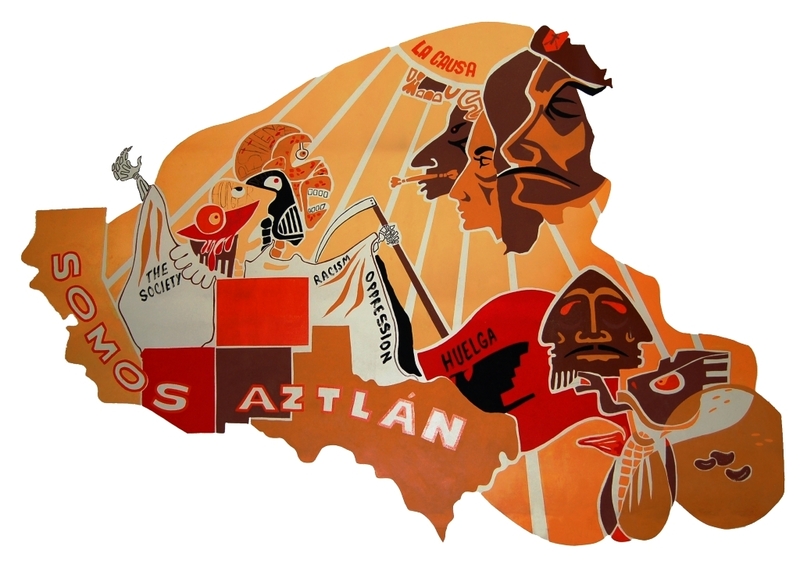 Students will understand what the Chicano Movement was, and also how those involved impacted the movement through their art. Created by Danielle Woods and Gonzalo Guzman. 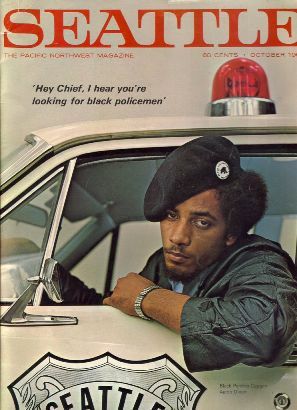 Students will use primary source documents and oral histories to explain why the Black Panther Party described black communities as “colonies” within the United States and how they attempted to empower those communities in response. The purpose of this lesson is to complicate students’ understanding of Seattle’s Black Panther Party (BPP) through exploring the duality of the organization. This unit includes a powerpoint presentation of images and oral history excerpts. Created by Teresa Frizell. 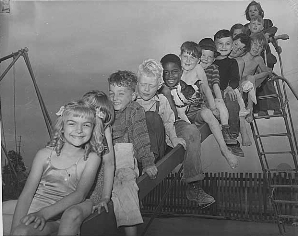 This lesson plan allows students to take on the role of a stakeholder in the community debate that occurred in Seattle over segregation in public schools during the 1950s and 1960s. The lesson uses the basic “town meeting” format to help students understand the issue of segregation in schools and one form of protest local civil rights groups used to create change in their community. Also, the lesson is designed to expose students to the various dimensions involved in one particular form of protest, a boycott. The point of the exercise is not the vote that takes place at the end, but the critical thinking and communication that happen along the way. Created by Stacey Joyce, M.Ed. This lesson plan fulfills the requirement for the state-mandated Classroom Based Assessment. We guide teachers and students through the “Causes of Conflict” CBA using the oral histories, historical photographs, and primary and secondary sources found on our site. With our site as a gateway to these resources, along with worksheets for the students, the CBA becomes a manageable and enjoyable student-led research project. Created by Teresa Frizell. 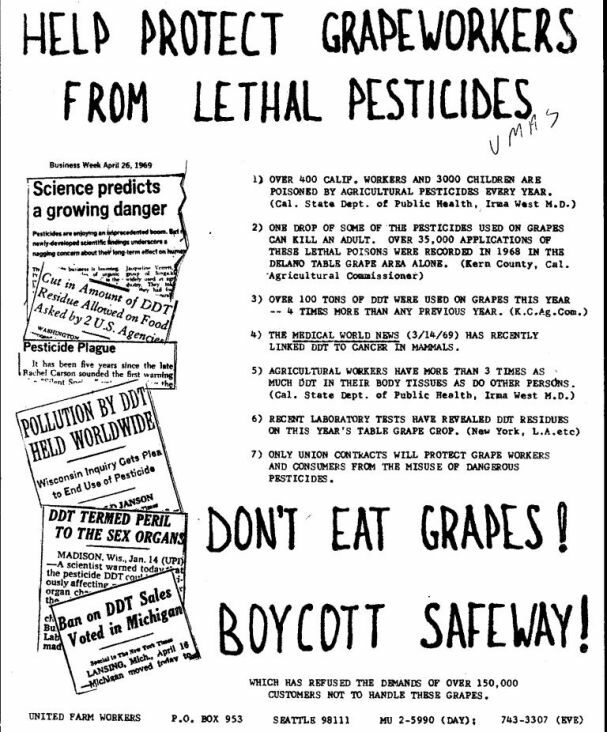 Students will examine and assess the tactics used by Chicano students and their allies at UW in their successful attempt to remove non-union grapes from all campus eating facilities during the United Farm Workers grape boycott of 1968-69. They will connect these activities with present-day responsible- consumerism movements such as Fair Trade and sweatshop-free and assert whether and how these tactics could be used as a model for their own activism. The purpose of this lesson is to serve as an anchor for any of the other lessons found on our website. By offering students an introductory and conclusive activity that relates Seattle’s civil rights struggle to their own goals for their lives and their communities, students will leave the unit feeling empowered to enact change in the same manner that earlier civil rights activists have done. We highly recommend that the essay be assigned in conjunction with one of the other lessons on our site, or a lesson of your own. The T-Chart and introductory essay found here would be assigned first. Work on another lesson comes next. The conclusive essay would wrap up the unit. Created by Stacey Joyce, M.Ed. 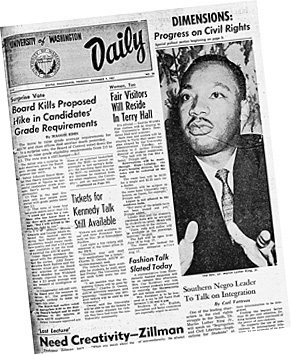 At the invitation of his friend, Reverend Samuel B McKinney, Dr. Martin Luther King Jr. came to Seattle in November 1961. The visit proved to be much more controversial than expected.This lesson uses a dramatic interview by Rev. McKinney and provides opportunities to learn about Dr. King and also about discrimination in Seattle.